The Procurator General of the Confederation of the Oratory has announced that the Holy See has formally established a new Oratory at Port Antonio, Jamaica. This is the first Oratory of St Philip Neri in the Caribbean. There are now seven Oratories in the Commonwealth: Birmingham, London, Toronto, Oxford, Oudtshoorn, Port Elizabeth and Port Antonio. Who are The Oratorians in Port Antonio ? The Congregation of the Oratory of St. Philip Neri of the Port Antonio Oratory, is a Congregation of Pontifical Right and member of the Confederation of the Oratory of St. Philip Neri. The Congregation of the Oratory was founded in Rome by St. Philip Neri in the 18th Century and approved in 1575. Priests from the Archdiocese of Kingston in Jamaica, Fathers Samuel Alloggia, Joseph Burg, Roland Dessine, Michael Palud, Brad Smith and Raymond Sorin, were encouraged by his Grace Archbishop Charles Dufour Of the Archdiocese of Kingston on the Oratorian path undertaken after a number of years of common life and Apstolate in Jamaica. Following the juridical steps outlined by the Confederation of the Oratory we have had the immense joy of paternal support of the Archbishop of Kingston as well as The Procurators General of the Oratory of St.Philip Neri, Fathers Edoardo Cerrato, C.O. now Bishop of Ivrea in Italy and his successor, the Very Rev. Fr. Mario Aviles, C.O. The Congregation of the Oratory of Port Antonio was formally erected by Decree of the Holy See on July 16, 2014. • Priests of the Congregation of the Oratory are secular priests; that is, they do not profess religious vows yet they are incardinated in their Congregation. 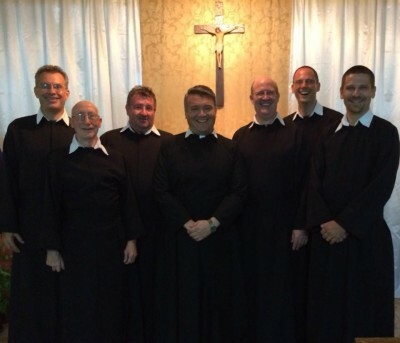 The Oratorian vocation is unique in the Church: secular priests living in community. Blessed John Henry Cardinal Newman, an Oratorian himself, called the Oratorian life a bridge between diocesan and religious life. • Oratorians live a fraternal life in a stable community. They make a commitment to one local Congregation and remain there for life. Living as a family is key to the Oratorian way of life. • Their spirituality is marked by fervent prayer, reverent celebration of the Sacraments (especially Mass and Confession), familiar preaching of the Word of God, and a joyful love for God and neighbour, particularly their brothers in the Congregation. Their motto is to “Serve in Joy”. St. Philip used to say that there was no place for melancholics in his Congregation!